After his early days as guitarist of neo-classical progressive rock band “Procol Harum,” Robin Trower branched out to forge a dynamic solo career that exhilarated the rock and roll world with his guitar excellence and dynamic song writing. From his classic “Bridge of Sighs” (1974) and “In City Dreams” (1977) CD’s to the recent critically acclaimed “What Lies Beneath” release, Trower has evolved as a guitarist and lyricist and continues to impress. One of the most underrated guitarists on the planet, Trower recently played B.B. Kings (see article on this site) for a two night run and wowed the packed houses. Review Fix interviewed Trower while he was on tour and spoke about his guitar influences, sharing a bill with Jimi Hendrix, recording and playing Shea Stadium in the 1970’s. Review Fix: Thank you so much for taking the time today. I know it’s been a very busy tour. I looked at your itinerary. Was it from June to now? 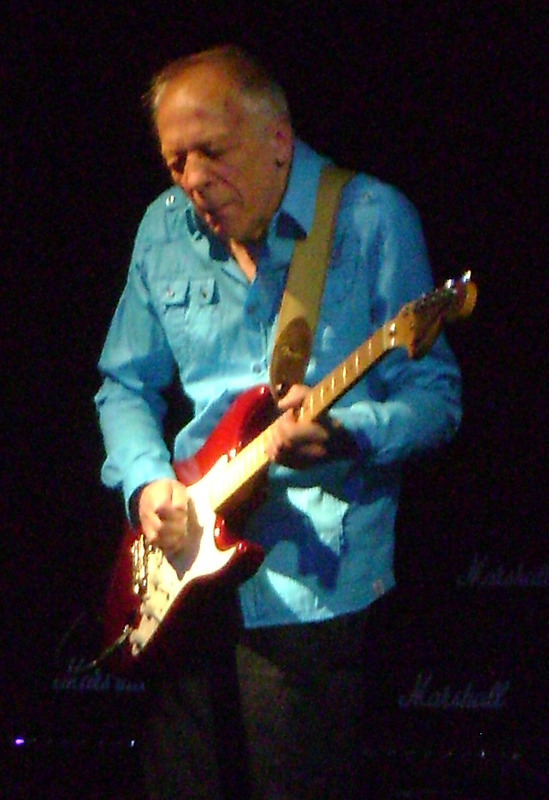 Robin Trower: We’ve done the U.S. in two sections: Seven weeks each section; first on the west and now we’re on the east as it were, and we had a break in the summer, but I was touring in Europe with Jack Bruce. RF: Seven Moons ( Jack Bruce and Robin Trower album ) was released as a CD and a DVD also? Trower: There’s a Seven Moons live DVD, but Seven Moons the album was actually out a couple of years ago. RF:How has the tour been? I saw you at B.B. Kings on September 19th and I thought the crowd was really enthusiastic, just fantastic. Trower: I really enjoyed B.B. Kings. It was great. RF:The tour, itself – just the different audiences – is it the same reception? Trower: Yeah, pretty much universal. RF: How would you differentiate the response? And in Europe, I think, you played a blues festival in Italy, and played in Norway before that. Trower: Yeah, very good, I mean not quite as vocal as the U.S.
RF: David and Derek Sutton have been very accommodating. They sent me a copy of “What Lies Beneath” ( latest Trower CD), and I’m very impressed. It’s very atmospheric and the tracks flow together. Is that plan your idea? Trower: I really wanted to make every track fit in terms of vibe. I think that’s why I wanted the tracks to flow together like that. RF: Why didn’t you use your touring band? I think you used David Pattison on backup vocals, but why didn’t you use the touring band? Trower: It’s just convenience, really. Everybody on the road – everybody that played with me on the road – lives in America, and I was making the album in England. RF: Do you think the latest CD is a complement to your career or a new direction? I just love the sound; it has so many different elements of different styles of music in it. Do you think it is supplemental or some new direction? Trower: A bit, I think.I won’t say it’s a new direction because the stuff I’m working on for the next album isn’t particularly like that, but there will be elements of it there. RF: What I like about it is that the instrumental work is fantastic as usual – some really great lyrics too on the tracks, fantastic lyrics. Trower: I’m glad you like that. I worked pretty hard on that side of things. RF: And your vocals sound good on it, too. Trower: Thank you very much. RF: How much have you sung before? Trower: Just bits and pieces over the years. RF: The members of the current band are a great bunch of musicians. Peter Thompson was in the band “Silverhead.”( I interviewed the lead singer Michael De Barres on this website), and Davey Pattison was in the band Gamma. What makes this combination so special? I really like the way you guys sounded – fantastic; how long are you with this version of this band? Trower: We actually worked together for a while in the ‘80s, and this band has been together a few years now and that’s why I think you got that sort of real glue to the performance, because we have worked together so much. RF: I love the chronicling of the recording process in the CD notes , getting back to the album “What Lies Beneath” Was that your idea? Trower: Yeah, I just thought it might be of some interest, just to keep up to date of what I’ve done so far and I could look back and see what I needed to work on, et cetera. RF: Livingstone Brown (bass) helped produce it, right? Trower: Yeah, he produced it. RF: The sound is just fantastic. Did you have a very good relationship working with him and the other people on the CD? Trower: Yeah, definitely. I mean Livingstone was my bass player and vocalist during the ‘90s. I had a band together with him, and we worked on and off together, since then he sort of went into production; he’s a very gifted guy. RF: Can I go back to the past a little bit? RF: Is it okay with you? RF: You had a long relationship with Gary Brooker (Procol Harum keyboardist and vocalist). You started with him in a band called The Paramounts, right? RF: What was that band like? Trower: It was mostly soul and R&B covers, Ray Charles, James Brown. Stuff like that. RF: Isn’t it interesting that your relationship evolved into being in “Procol Harum” which was an innovative band? I call them a neoclassical, classic rock band. Trower: Well the thing is after The Paramounts, Gary really started strongly becoming a writer, and that was what “Procol Harum” grew out of the fact that he got together with Keith Reid, the lyricist. RF: Didn’t Matthew Fisher produce later albums of yours? Trower: He produced my first three solo albums. I’d encourage you to check out “Seven Moons”, Steve. IMHO, about half of it as good as anything on BLT. Steve,, I enjoyed the interview. I did not know that Mathew Fisher produced his first 3 solo lps. Nice interview. Robin has always been a man of few words and generally reluctant to talk about himself. This interview was quite enjoyable and several tidbits that I was unaware of were brought to light. Good work! I had the pleasure of meeting Mr. Trower on the tour. He is a most polite gentleman I’ve ever met. I have followed Robin back to the “Procol Harm” days and his solo work, I hope Robin makes stops in St. Louis, MO. in 2011. Robin Trower is a genuine humble man with a kind and deep Soul…its obvious in his music..have seen him countless times over the years..and his dedication to great music is always impressive. have been fortunate enough to have met him on several occasions..He is a very polite and caring gentleman….true story..around 1986 in Atlanta .. Saw him play at the International Ballroom(now defunct) and I was lucky enough to win a Stratocaster giveaway..afterwards .. went backstage to meet him..and asked him to sign the Strat..which he did ..but was very polite to ask if I was sure I wanted him to autograph the guitar..I still own that Strat and it has been set up for the D tuning thing that Robin uses..I still play that guitar frequently esp when going for that signature “Trower” sound..He is a true master player..tone,richness, and quality of notes..never gets old even in this day of “shredding” techo style..He has been a major major influence on my evolving style and I will always be grateful for his superb and brilliant, deep soulful talent…needless to say ..I will be seeing him again..on feb 5th @ Variety Playhouse in the ATL…thanks Robin!